Frontier Raas Has Opened Their Doors in Vasant Kunj With All New Pret And Couture Collection! Right in time for the wedding wave of 2018, a legacy in ethnic collection, Frontier Raas has launched in Ambience Mall, Vasant Kunj. After a huge success with their previous stores in South Ex, Karol Bagh and Chandigarh, they are bringing a selected range of premium Raas saris which will help you look like a royalty. From ethnic wear for weddings to ready-to-wear collection for those last minute shopping decisions, they have it all to sort all your shopping woes. Head over to this store and witness an evergreen collection of bedazzling motifs and signature silhouettes. Best part? This store is no less than an experience from the very moment you step in. 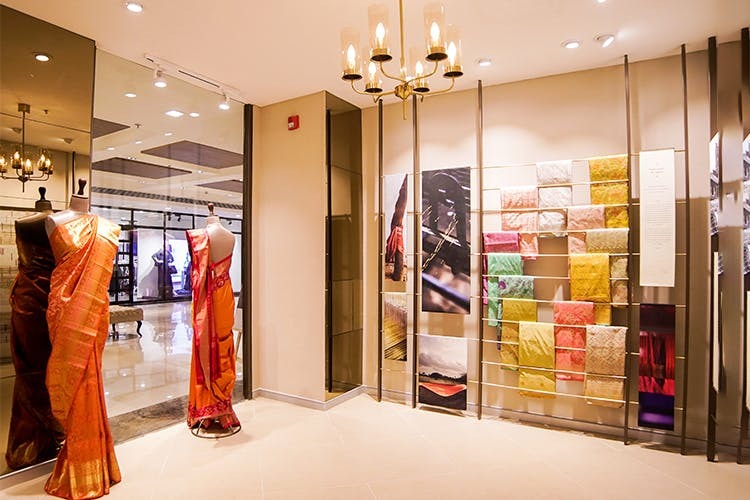 Announcing a milestone in curating the best of wedding wardrobes for 6 decades, the expansive 4000 square ft retail store in Ambience Mall flaunts a wide collection of fabrics and yardages that promise to delight textile connoisseurs along with the finest hand embroideries that are the hallmark of the brand. If you’re not one of the impulsive buyers when it comes to wedding shopping, their wide range of fabrics will give you a plethora of options which will let you design anything possible under the sun. This exclusive store houses some of the top trending styles, made with best textiles handpicked and designed with great love and care. If the wedding madness has got you wondering where to get all that you need, we say head over to their store at Ambience Mall where every section showcases breathtaking artistry, celebrating the cultural mastery of India and its craftsmen.